The Agenda 2030 is the result of the joint work of governments and citizens around the world to create a new global model for ending poverty, promoting prosperity and well-being for all, protecting the environment and combating climate change, and integrates 17 Sustainable Development Goals (SDGs), to be implemented by all countries and covering such diverse but interlinked areas as: equitable access to quality education and health services; the creation of decent employment; energy and environmental sustainability; conservation and management of the oceans; the promotion of effective institutions and stable societies; and the fight against inequality at all levels. 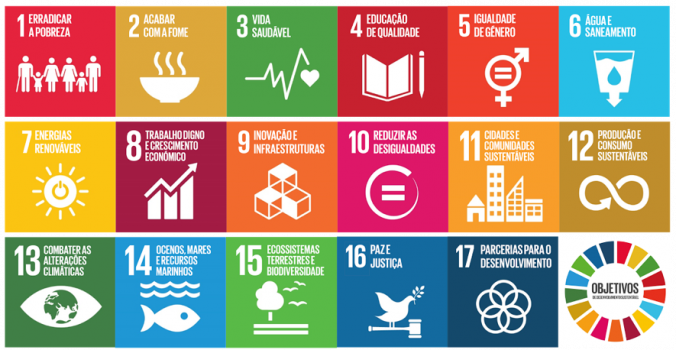 The University of Trás-os-Montes and Alto Douro (UTAD), as higher education institution, has the ambition to contribute, through the commitments established in its Strategic Plan 2017-2021, as an active agent in the transformation of the world, to achieve all objectives of this Agenda. In the framework of the values underlying this Plan, we assume the centrality and value of people and their participation, the importance of equality and inclusion, and the promotion of the sustainability of the Planet. On the other hand, we affirm ourselves as an institution that thinks globally and acts locally and globally, engaged in reflection and action for a more prosperous and sustainable world, with a culture of social responsibility and networking, focused on quality and with an international vision, in interaction with the scientific, business and political worlds, and with the society in general. Strengthening the role of UTAD as a vehicle and promoter of the Agenda 2030 in the context of its relations with the community, with businesses and other public or private entities. Support for students with difficulties through the Social Support Fund. Allocation of scholarships through patronage (Symington Estates, Maria Rosa Foundation, Júlio Resende Foundation and other institutions). Qualification of social support infrastructures, based on the organizational culture of promoting comfort, functionality and sense of community. Combat food waste and provide leftovers to community institutions and support local organizations with intervention in this area (Caritas, Refood, etc.). Support to the Alliance against Hunger and Malnutrition in the preparation of the map of the distribution of food aid in Portugal. Installation of the Fraunhofer Center delegation in precision agriculture. Medical, psychological and nursing support to students and workers through SASUTAD. Implementation of a program of sports, cultural and social responsibility activities, through the Library, the Cultural and Sports Activities Sector of the SASUTAD and the Academic Association. Education for the consumption of fresh food, dissemination of nutritional information of the menus and encouragement of healthy choices. Accompaniment of the students’ schooling, through initiatives of reception, mentoring, increase of the competences and prevention of the abandonment, that allows them to reach the best school success. Consolidation of forms of support for students, with special emphasis on students with special needs. Reinforcing the visibility of Science and Technology in society in general and in the educational community in particular, by promoting a Summer University, Open Day, and by the continuity of the Science and Technology Week, the Junior University and the Science and Society Week. Commemoration of the International Day for the Elimination of Violence against Women and the promotion of other initiatives in this area. Implementation of the Waste Management Plan and design of an Action Plan for the Treatment of Liquid Effluents, including training for the academy. Campus certification under the NP EN ISO 14001 and 50001 standards, including training for the academy and dissemination of good practices for environmental sustainability. Implementation of measures to improve the energy efficiency of buildings with a view to reducing consumption and emission of greenhouse gases. Faculty renewal, including competitions for researchers and auxiliary teachers. Valuation of human resources including the opening of competitions for associate professors and professors and the career mobility of non-teaching staff. Implementation of the Pedagogical Training Plan for teachers in articulation with the consortium UNorte.pt. Training of non-teaching and non-research workers. Dematerialization of academic and administrative processes, extending to the processing of the acquisition of goods and services, electronic invoice, bulletins itineraries and process of hiring teachers. Reinforcement of connectivity in collaboration with the Foundation for National Scientific Computation (FCCN) and preparation of the application to strengthen internal connectivity on campus and in the residential area. Creation of the innovation office that aims to boost pre-incubation with the Regia Douro Parque, transfer of technology, innovation and industrial property, and the promotion of a culture of entrepreneurship. Promotion of circular reading through Bookcrossing in the Library: sharing of books for enjoyment and encouragement of the taste for reading. Certification of the campus (norms NP EN ISO 14001 and 50001) and dynamization of training and dissemination of good practices of environmental sustainability. Interaction events with society, Eco @ utad and the Summer Innovation Campus. Promotion of campus enjoyment initiatives by community members, ensuring that it is green space, safe and affordable. Training of the sustainable mobility plan, involving the initiation of the construction of a bicycle lane in articulation with the local authority, under the Strategic Plan for Urban Development (PEDU) financed by the North of 2020 and the reinforcement of the ongoing U-bike program. Creation of the platform for resource management and accounting for carbon sequestration on campus. Development of research and systematization and dissemination of knowledge on the sustainable management of natural resources, promotion of sustainable agricultural systems and the valorization of regional and local agricultural and food products. Research development, systematization and dissemination of knowledge about climate change and its impacts. Participation in the Do Mar international doctoral program involving a consortium of universities and research institutions in Portugal (Universities of Aveiro, Minho and Trás-os-Montes and Alto Douro) and Spain (Universities of Vigo, Santiago de Compostela and Coruña, The Spanish Institute of Oceanography and the Consejo Superior de Investigaciones Cientificas), as well as the partnership with the School of Biology of St. Andrews University (Scotland), Roscoff Station Biologique of the Pierre et Marie Curie University (France) and the Institute of Oceanography of the University of São Paulo (Brazil). Support to the Center of Science of Vila Real in the accomplishment of initiatives of promotion of the environmental awareness, of the protection of the animal and vegetal biodiversity and of the spirit of citizenship in front of the natural world that surrounds us. Valuing the Eco-Campus as a space for the promotion of biodiversity and conservation of ecosystems, carrying out information and training activities involving academia and the community. Implementation of the waste management plan and design of an action plan for the treatment of liquid effluents, including training activities for the academy. Support for the recovery of wild animals through the Center for the Recovery of Wild Animals of the Veterinary Hospital of UTAD. Installation at UTAD of the Collaborative Laboratories in the areas of Forest and Vine and Wine. Realization of a program of events for the integration of Erasmus and international students and the promotion of multi and interculturality, in conjunction with ESN and African and Brazilian Student Associations. Review and update of the Risk Prevention Plan for corruption and related infractions of UTAD. Participation in the project to strengthen the capacity of Higher Education and Teacher Training with the University of São Tomé and Príncipe, in collaboration with the Instituto Superior Técnico and the Leiria Polytechnic Institute. Reinforcement of the internationalization culture involving, among other actions, the provision of pedagogical content in English, including study and information plans on the web page and the intranet. Strengthening the network of international partnerships, including joining the Compostela Group of Universities. Strengthening the participation of teachers and researchers in international events. Promotion of a program of activities within the framework of the UNESCO Chair in Geoparks, Sustainable Regional Development and Healthy Lifestyles. Reception of the Ibero-American Summit of Universities in collaboration with the Ibero-American General Secretariat, promoting the implementation of cooperation protocols.